If you think authentic cheesecake flavor is impossible without the cheese, think again. Raw cheesecake happens to be one of the most authentic tasting raw desserts, thanks to the magical combination of cashews and coconut oil. 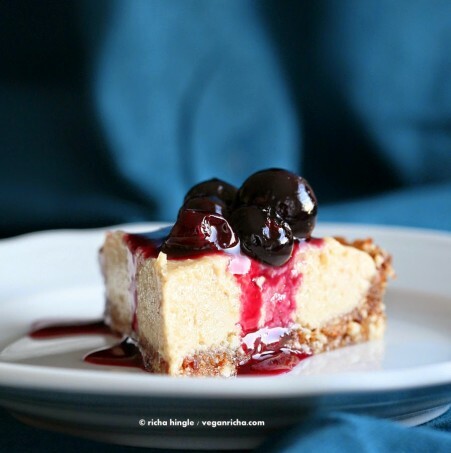 The cheesecake is easier to prepare in a high-speed blender than a food processor, but the processor can work if that’s what you have. Just be sure to soak your cashews overnight! If you don’t have cashews, macadamia nuts are a perfect substitute. What I like about this book is that it gradually introduces you to raw options. 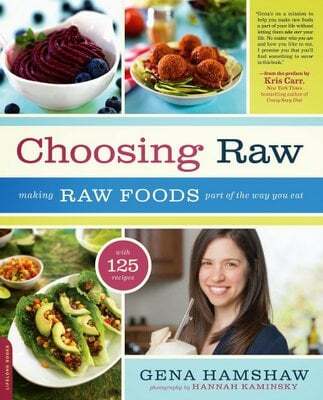 The book is not about eating entirely raw all the time. It makes it easy to add the raw and regular plant based meals to everyday options and allows you to choose your way of healthy eating. There are chapters that take you through “Tried and tested” recipes with everyday cooked food mixed with some raw, the next level introduces you to “something new” and then takes you to the “Brave new world” of raw food. The book has chapters on nutrition and Myths and misconception which cover information on protein, questions about soy, fats, oils and more. There is a dizzying amount of information on the web and extreme ideas about some of these topics. I was very happy to see a balanced perspective on the topics in the book. I have followed Gena’s blog for a long while now and have been continuously impressed with the knowledge she has to share. Her posts are insightful, food simple and delicious and the blog humble and welcoming. I made a couple of recipes from the book and have book marked a bunch more to try this summer like Mesquite glazed Tempeh, Raw Carrot Falafels, a couple of the dressings. The decadent Blueberry cheesecake was made into personal tarts so I could keep some for hubbs later. 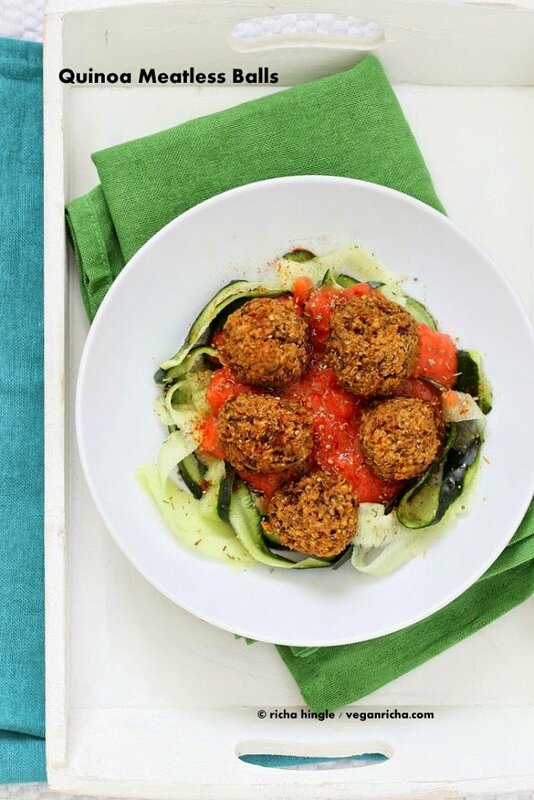 (pictured above) Quinoa Meatless balls served with zucchini badly made into wide pasta. I don’t have a spiralizer or julienne peeler :). The meatballs come together very easily and can be added to anything. Caesar dressing from the Dinosaur Kale and Bean Salad. 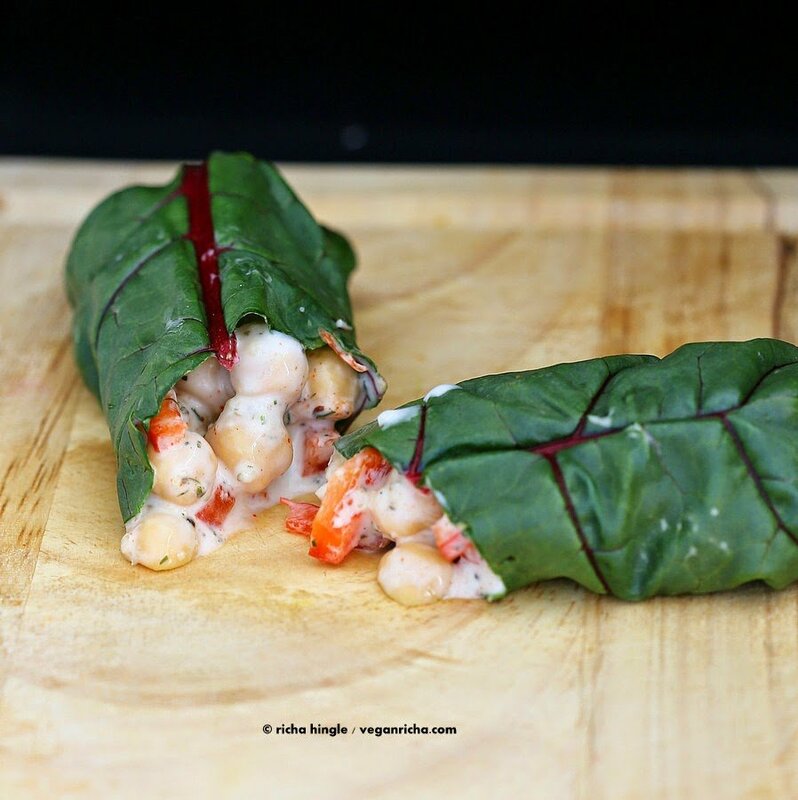 Tossed in some chickpeas and peppers and made Rainbow Chard wraps. Gena is a nutritionist and everything in the book comes from research and not claims. She also tells you her story through her eating disorder, fully raw to the mixed raw diet which is written very honestly and the story is very engaging. There are 125 recipes, 21 meal plans, and absolutely beautiful photography in the book by Hannah Kaminsky. Place the almonds and sea salt in a food processor and grind roughly. Add the dates and process until the mixture is well processed and sticks together when you squeeze a bit in the palm of your hand. Press the mixture evenly into the bottom of a 9-inch springform pan. Use a high-speed blender or food processor (high-speed blender is preferable, but a food processor will work as well) to process all the filling ingredients thoroughly, until they are silky smooth. If you’re working with a processor, you may need to stop often to scrape it down. Pour the mixture over the layer of crust and use an inverted knife to smooth it over. Place the cheesecake in the freezer for an hour, then transfer it to the fridge and let it set overnight. 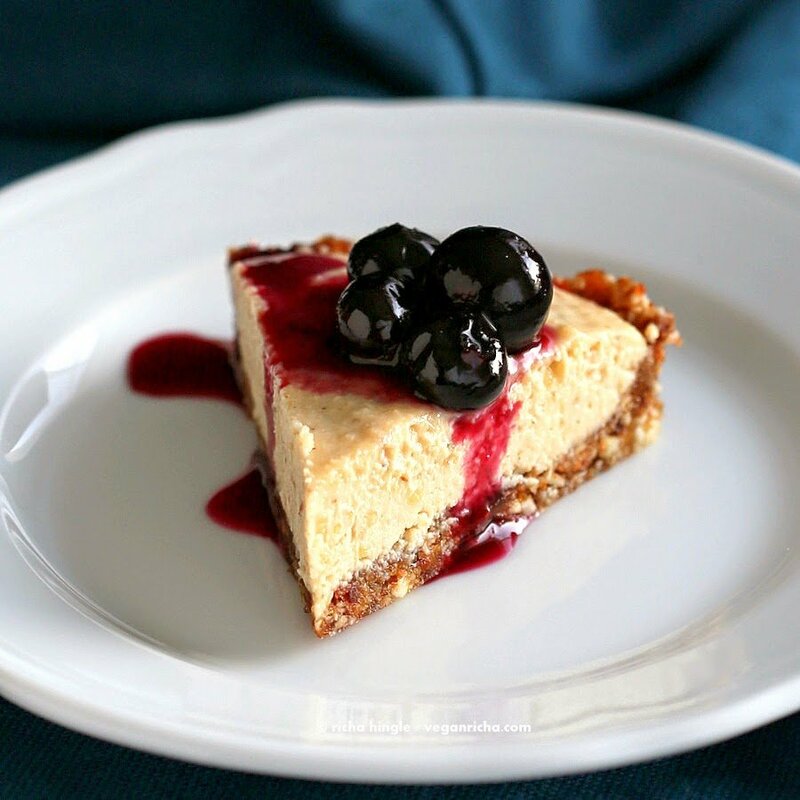 When the cheesecake has set, blend 1 cup of blueberries, the lemon, and the agave nectar in a blender until smooth. Transfer to a small bowl and stir in the remaining whole blueberries. Pour the mixture over the cheesecake (or you can spoon it over individual slices). Serve. Cover and store the cheesecake in the fridge for up to 3 days, or in the freezer for up to 10. If you freeze the cake, defrost the slices in the fridge for several hours before serving. Walnut taco “meat” with sundried tomatoes, chili powder, garlic powder and coconut aminos…wrapped up in a collard green. YUM!! I need some new RAW recipe ideas. Would love to have this book for that and to read about the author’s journey! I love combining raw oats with the fruit I have on hand for a quick, high fiber snack. Better than granola bars and much less expensive. Easy to pack too and stores well. My favorite raw food is a morning smoothie with chia seeds, grapefruit, blueberries, and some cashews for creaminess. YUM! These look delicious. I wanted to try chili and the sour cream tonight for dinner and hope everyone like it. favorite raw dessert most definitely cheesecake! I know its sort of cliche be my favorite raw meal is still got to be smoothies, doesn’t really matter which flavor I just love the idea of packing all that food and nutrients into one drink where the same amount of food in its whole state would be more difficult to finish. Guacamole or banana soft serve. Or just a really huge green salad! Oh wowww those look so delish! Thanks for the chance to win this book. My favorite raw dessert is espresso walnut brownies. Yum! Hello, any idea with what to substitute coconut oil? I am allergic but the recipe looks way to delicious to pass…thank you! you can use more cashews or use some vegan butter. Without the coconut oil, the cheesecake might not set very well. Freeze for some time and then slice. Hi! I tried your blueberry chocolate muffin recipe the other day and it was sooo good!!!! 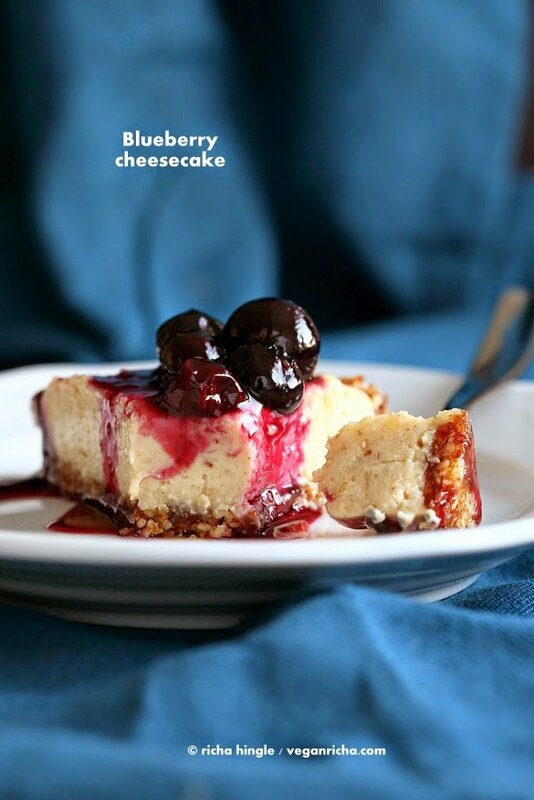 Just a quick question, about the blueberry cheesecake recipe. Can I sub agave nectar with maple syrup? If yes, do i use the same amount as agave nectar? Thank you. I have some store bought crust =) Would agave work? I could buy the Canadian maple syrup if not. The calorie count says per serving. Is that for 1/4 of the cheesecake?